1. 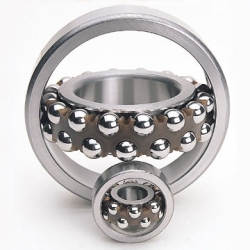 The self-aligning ball bearing has two rows of balls and a common concave sphered raceway in the outer ring. The bearing is consequently self-aligning and insensitive to angular misalignments of the shaft relative to the housing. It is particularly suitable for applications where considerable shaft deflections or misalignment are to be expected. Additionally, the self-aligning ball bearing has the lowest friction of all rolling bearings, which enables it to run cooler even at high speeds. With two structures of bore cylindrical or tapered and retainers made of steel sheet or synthetic resins, the bearings are characteristic of their spherically formed outer ring raceways allowing for misalignment within 3 degree deflection between inner ring and outer ring, so as to compensate concentricity and deflection errors. Widely used in machinery of mining, power, and textile etc. Self-aligning ball bearings is of the double row type. With a spherical outer ring raceway their self-aligning capability allows them to compensate for misalignments, shaft deflections and housing deformations. It can support both the radial and axial load. As the same dimension as the aligning roller bearing, the rotate speed is quicker. The self-aligning ball bearing is mainly used in the shaft which is easy to be bended under the load effect. And Self-aligning ball bearings is also used in the parts of double housing bore which can't guarantee the same axial degree. in the meantime, the incline angle between outer ring and inner ring is within 3 Â°.